TOKYO — The Olympic flag arrived here Wednesday after a 28-hour flight from Rio de Janeiro, as Japan prepares to show the world that its planning for the 2020 Games will be as precise as preparations for the Rio Games were chaotic. Ground already has been broken on a new Olympic Village, and site preparation is nearly complete for a new National Stadium that will host the opening and closing ceremonies and major field events. Ambitious plans call for dazzling new venues, development of the city’s under-used waterfront district and the use of futuristic technologies like hydrogen power and humanoid robotics. The 2020 Games will debut five new sports: baseball/softball and karate — which are likely to produce medals for the Japanese — plus skateboarding, surfing and sport climbing. Though planning is well underway, there have been bumps along the road. The original stadium design was rejected after cost estimates tripled to $2.2 billion. Other venues have been relocated, scaled back or canceled because of rising costs or environmental concerns. 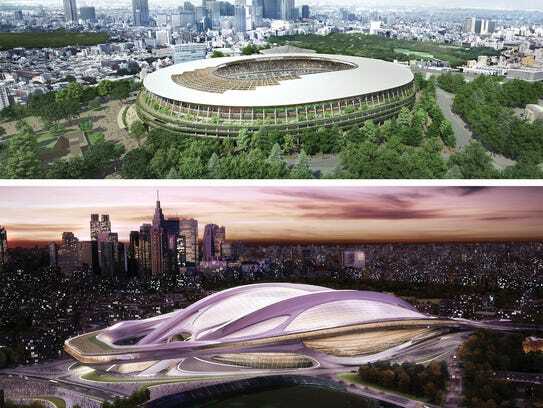 Tokyo’s original plan called for a “compact” Games with two-thirds of all venues located within 5 miles of the athletes’ bayside village. That’s been reduced to half and Tokyo’s new governor, Yuriko Koike, has called for a formal review that could bring further changes. “I will not leave white elephants to the taxpayers,” Koike, the first female elected to the post, said in Rio last weekend. Tokyo has set aside $4.5 billion to build venues and operate the Games, but that may not be enough, given Rio’s painful experience. The 2016 Olympics will cost $4.6 billion, 50% more than an economically struggling Brazil had expected, according to a study by Oxford University’s business school. Olympian cost overruns should be no surprise, said Eva Leeds, an economics professor at Moravian College in Bethlehem, Pa., who has studied the Tokyo bid. Tokyo first hosted the Olympic Games in 1964, when Japan was still struggling to emerge from the shame and devastation of World War II. The city had few decent roads or modern hotels, but the Games helped usher in world-beating “bullet” trains, a futuristic monorail and elevated highways, providing a foundation for what is now one of the world’s most advanced cities. “The (1964) Olympics served as the impetus for a crash course in modernizing the city in terms of infrastructure, cleaning up — or paving over — polluted waterways and building the necessary hotels for tourists and visitors,” said Paul Droubie, assistant professor of history at Manhattan College in New York who has studied the ’64 Games. Despite such advances, challenges remain. Japan’s shrinking labor force and continuing reconstruction from the crippling 2011 earthquake and tsunami have left the country short 700,000 construction and service workers needed for Olympic-related projects, the Bank of Japan warned in a report this year. “A potential risk is that construction projects may be delayed, essential services will not be provided, and investment other than that for the Olympics may be crowded out,” the report said, adding that it is an “indispensable” boost to the workforce by increasing the number of female, older and foreign workers. Such efforts have largely failed in the past. Another potential problem could be Tokyo’s notorious summer weather. The 1964 Games were pushed back to October to avoid the worst of the heat and humidity, but the 2020 Games will take place July 24 through Aug. 9 — smack during the summertime heat. Officials plan to start some outdoor events early in the day and will look to technology to keep competitors, workers and visitors cool.